This Mystery Depths retreat awaits those who love to inquire, who dare to listen at the edge and in the depths—to be in the frontier conversation—who are aware of the adventure of courting the unknown and who allow the unknown to disrupt what is known. This week is devoted to practices of awakening, silence and courtship of the mystery. Treat yourself to a luxurious time of moving, meditating, musing, and dancing in a self-regulating process that is nourishing, organismically wise, personally and universally revelatory. In deep long Continuum dives, we slow down, and transform through gentle breathing, primordial vocalizing, and engage a multi-faceted movement range that may be both wild and tender. We melt and restore in spacious Silence. We listen into the sensuous intelligence of the living matrix, until we can perceive through feeling, a subtle emergence—a new movement birthing, a surprising insight that is fresh, yet ancient and wise. 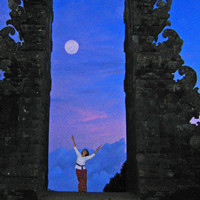 This retreat includes a "soul quest" time where we are in collective silence for two days. As we deepen, each of us awakens our unique mystery-opening capacities. The fecundity of our spontaneous personal discoveries along with our shared co-creating, expands our minds and opens our hearts. As we plumb the depths together, outworn skins shed, healing happens, and we emerge with a deeper sense of creativity and love. SUSAN HARPER opens portals of exploratory consciousness. She has the ability through demonstration of sounds, breaths, and movement to transmit a primal and spiritual fluidity that inspires participation resulting in embodied innovative discoveries. She has been teaching and contributing to Continuum since 1975. Susan brought Continuum to Europe for the first time in 1992. Her work is inspired by Hubert Godard with whom she co-taught for many years.